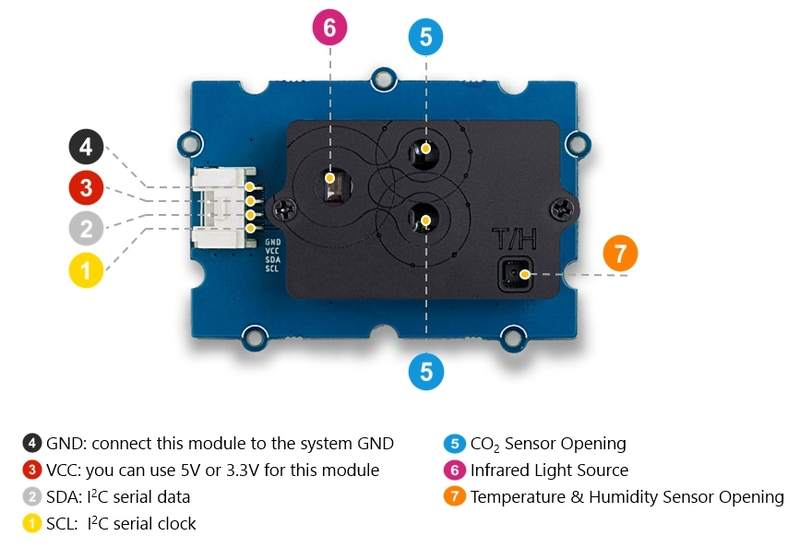 The Grove - CO2 & Temperature & Humidity Sensor (SCD30) is a high precision carbon dioxide sensor, which is based on Sensirion SCD30. 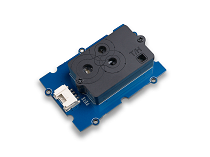 The measuring range of this sensor is 0 ppm-40'000 ppm, and the measurement accuracy can reach to ±(30 ppm + 3%) between 400ppm to 10'000ppm. In addition to the Non-Dispersive Infrared(NDIR) measurement technology for CO2 detection, the SCD30 integrates Sensirion humidity and temperature sensors on the same sensor module. 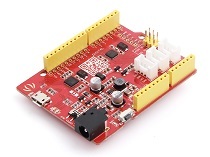 In addition, you can consider our new Seeeduino Lotus M0+, which is equivalent to the combination of Seeeduino V4.2 and Baseshield. Step 1. 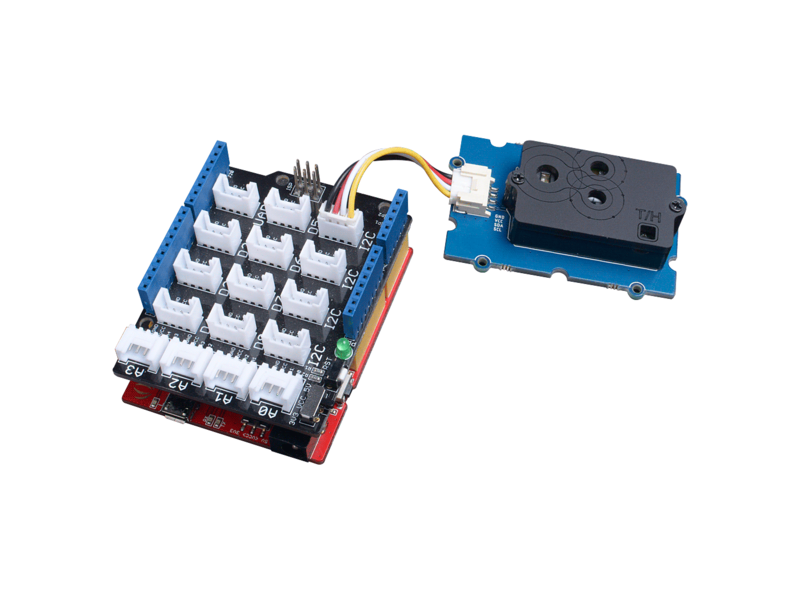 Connect the Grove - CO2 & Temperature & Humidity Sensor (SCD30) to the I2C port of the Base Shield. Step 1. 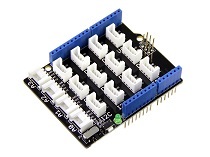 Download the Grove Multi Switch Library from Github. Step 2. Refer to How to install library to install library for Arduino. Step 3. Restart the Arduino IDE. Open the example, you can open it in the following three ways： a. 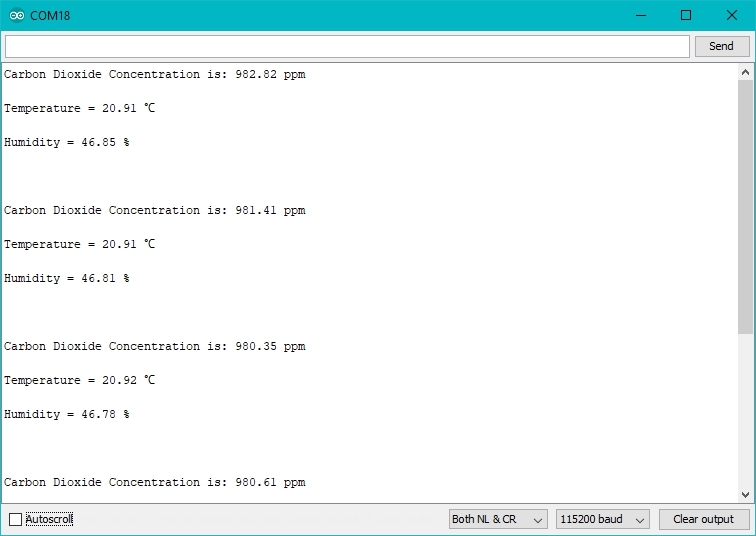 Open it directly in the Arduino IDE via the path: File → Examples →Grove_scd30_co2_sensor→SCD30_Example. b. 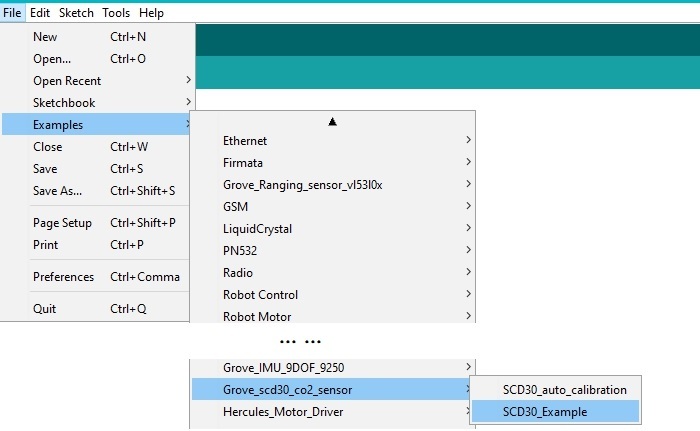 Open it in your computer by click the SCD30_Example.ino which you can find in the folder XXXX\Arduino\libraries\Seeed_SCD30-master\examples\SCD30_Example, XXXX is the location you installed the Arduino IDE. c. Or, you can just click the icon in upper right corner of the code block to copy the following code into a new sketch in the Arduino IDE. The library file may be updated. This code may not be applicable to the updated library file, so we recommend that you use the first two methods. If everything goes well, the raw data of the Grove - CO2 & Temperature & Humidity Sensor (SCD30) should be able to read from Serial Monitor. Please refer to the SCD30 Design-In Guidelines for the correct placement. There are two ino sample in the SCD30 library foldor, you can run the SCD30_auto_calibration.ino to start the calibration.